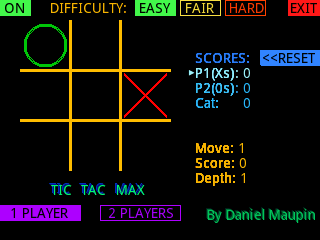 Description: The developer wanted to learn about the miniMax algorithm, so he wrote this tic-tac-toe game and implemented miniMax so you could play a game against your Prime, with a full touch screen interface. It checks through 7! (5040) possible moves to make its move. in the calculator? I got an error every time. Jimmy - Shift 9 then moving right one square on the top row should get you the symbol you need.